You are currently browsing the category archive for the ‘Coaching’ category. Whether you climb or not, this is one very powerful statement. The first time I heard this quote, I had just come home from a grueling (albeit exhilarating) hike in which I summited 3 peaks measuring over 14,000 ft in elevation each. When you start out on the trail looking up at what waits for you, you are taken over by looming doubt. “It’s so far away”, “I’ll never be able to do this whole thing!”, “The altitude alone is going to crush me” and many more of these thoughts bounce around in your head. So you take a deep breath and start up. Your hiking partners are so excited that you push those thoughts far back into your head. One step after another, breath after breath, just taking it all in. Soon you reach a point where you turn and look back over the ground you have just covered, and amazingly, you have traveled quite far. Your feet still work. Your lungs are noticing the altitude, but they still work. Snap a few photos and go on. You pass many like minded people on your way and each one is marveling at the scenery just as you are. You wonder if they are having the same looming thoughts. Getting to the top of the first peak is mind blowing. You are on top of the world. 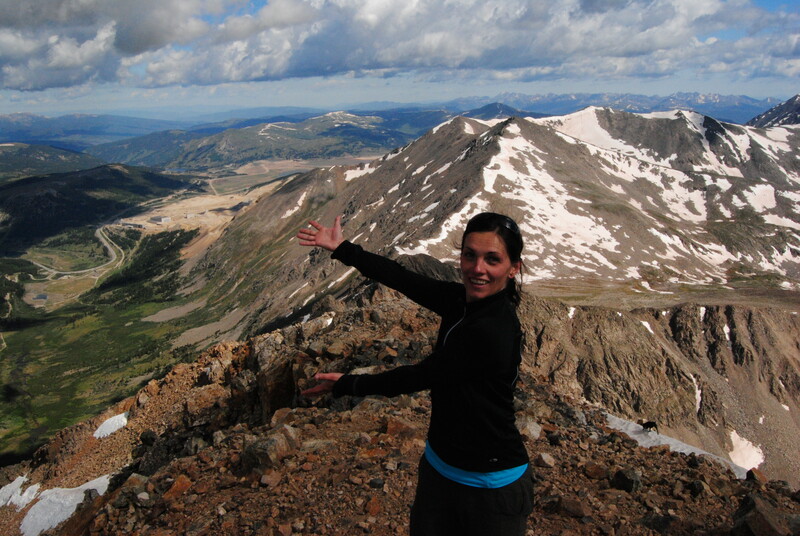 You look down at the trail you just took…There it is, 14,000 feet below you. Miles upon miles of trail winding down below your feet. You’ve done this much and your body is still in one piece. Your feet (although a bit more sore than when you started) are still carrying you. Grab a quick bite to eat and some water and off you go to the next peak. By the time you reach your car at the end of the day you are exhausted, exhilarated and in complete awe of what you have just done. Not to mention how unbelievably small you feel in comparison to those mountains. But you have done it. You have conquered your own doubts and fears, and pushed yourself way beyond your comfort level. Whatever your mountain is, just remember… “It’s not the mountain we conquer, but ourselves”. I think Sir Hillary may be onto something. * May 29, 1953, Hillary and Tenzing Norgay, (a native Nepalese climber) became the first to ever summit Mt. Everest. They were the only members of their party able to make the final assault onto the summit. P.S. — Want to learn more about how to “Conquer Your Mountains”? Schedule your private, confidential complimentary discovery session or send an e-mail to info@JoshuaTreeCoaching.com to learn how. Invest 30 minutes today to change your life forever. How often do you have “one of those days”? You know…the days where you have difficulty concentrating, distractions are the priority of the day, your focus is a very faint, distant memory and your “to do” list is longer and more complicated than an 8th grade science project. It’s at just these times you’ll want to engage the 3D Approach. Simply, Diligence, Determination and Discipline. These characteristics may not be “simple” to develop and maintain, for most of us. Yet, when you have just a little bit of diligence and discipline driven by determination, your day will progress that much better. And the more you practice the 3D’s, the more you get accomplished and the better your day will go. When you approach your life (business, job, career, relationships, recruiting, planning, etc.) with the 3D attitude, there will be few goals that lie beyond your reach. Distractions constantly threaten to derail progress; however, discipline enables you to focus amid disruptions and distractions. 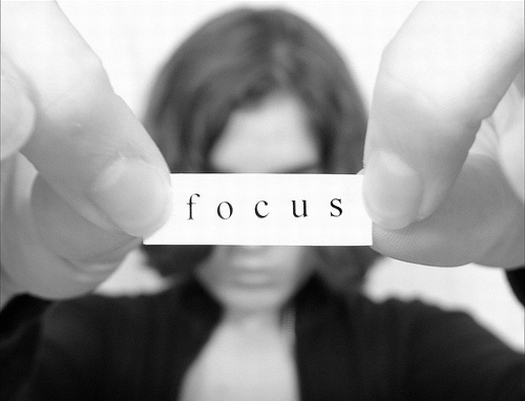 You get to choose where to place your focus, the important job at hand or the distraction (aka BSO’s – Bright Shiny Objects). The determination you get from discipline also gives you the courage and unshakable enthusiasm that allows you to perceive BSO’s (roadblocks, detours, distractions, whatever you want to call it) as a challenge to attack with enthusiasm. P.S. — Want to learn more about how to engage the 3D Approach? Tired of being at the mercy of your BSO’s? Schedule your private, confidential complimentary discovery session or send an e-mail to info@JoshuaTreeCoaching.com to learn how. Invest 30 minutes today to change your life forever. Expectations that you place on yourself or others can leave you feeling anxious and overwhelmed…at times leaving you feeling disappointed, exasperated or irritated. You easily lose sight of the things that are important and when you leave what’s important for those Bright Shiny Objects (BSO’s), a.k.a. distractions of thought, emotions, interruptions or other “important” things, you can experience unnecessary worry, anxiousness, helplessness and fear. Whether it’s shopping for last minute vacation items, getting your budget in place, deciding what event and activities to attend, financial concerns, working feverishly to meet your business quarter-end deadlines, or wanting to spend more time with loved ones, family and friends during this time of the year, all of these activities require grounded focus. When you’re consciously focusing on the things that matter to you – one at a time – your stress is reduced and you experience grounded focus. P.S. 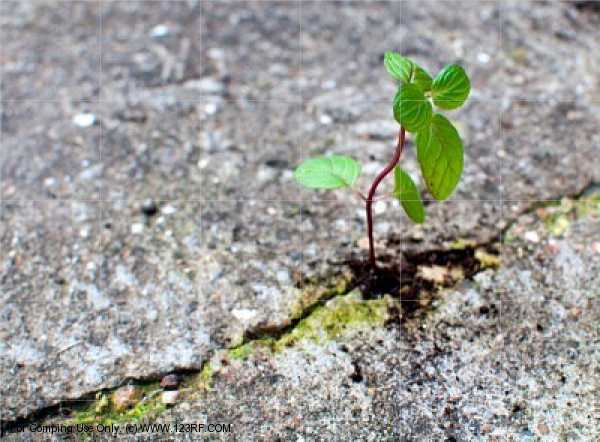 — Want to learn more about how to find your “Grounded Focus”? Tired of being at the mercy of your BSO’s? Schedule your private, confidential complimentary discovery session or send an e-mail to info@JoshuaTreeCoaching.com to learn how. Invest 30 minutes today to change your life forever. Everyone experiences cognitive distortions. Not everyone knows they have them and of those that do acknowledge their existence, not many people do something to challenge their cognitive distortions. Of those individuals that put in the effort and practice daily, the results changed their lives. Experience a life change by using the exercises below to weaken your cognitive distortions. Remember, these are not one-time “cures”. It takes work to give up your pain and the habits that hold you back. It’s not about giving something up as much as it is giving yourself something of greater value in return. Identify Your Cognitive Distortions – List your troublesome thoughts and match them with the list of cognitive distortions. This exercise allows you to see the distortions you favor and allows you to think about your problem, challenge or predicament in more natural, realistic ways. 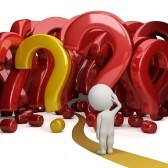 Examine the Evidence – Examining your experience thoroughly helps you identify the basis for your distorted thoughts. Example: If you are very self-critical, then you want to examine a number of experiences and situations where you experienced success. Double Standard Method – An alternative to harsh and demeaning self-talk is to talk to yourself in the same compassionate, understanding and caring way you would talk with another in a similar situation. Think in Shades of Gray – Rather than think about your problem or challenge in an either-or polarity, evaluate things on a scale of 0-100. When a plan/goal isn’t fully realized, think about and evaluate the experience as a partial success, again, on a scale of 0-100. Survey Method – Seek the opinion of trusted friends or relatives regarding whether your thoughts and attitudes are realistic. Definitions – What does it mean to define yourself as “a loser”, “inferior”, “a fool”, “stupid”, etc.? Examining these and other global labels will likely reveal they more closely represent specific behaviors, or an identifiable behavior pattern instead of you as the total person. Re-attribution – Rather than automatically blaming yourself for problems and predicaments, identify external factors and other individuals that contributed to the problem/challenge. Your energy is best utilized in the pursuit of resolutions or ways to cope. Cost-Benefit Analysis – List the advantages and disadvantages of your feelings, thoughts and/or behaviors. The cost-benefit analysis will help you determine what you are gaining from feeling bad, distorted thinking, and inappropriate behavior. P.S. — Want to learn more about Cognitive Distortions and how they may be impeding your progress and success? Tired of being at the mercy of your distortions? Schedule your private, confidential complimentary discovery session or send an e-mail to info@JoshuaTreeCoaching.com to learn how. Invest 30 minutes today to change your life forever. someones’ pain, it becomes compassion. Here’s a quick review of what we talked about in Part 2 of “What Were YOu Thinking?” You learned about Jumping to Conclusions, Emotional Reasoning, Shoulds, Labeling, and Blame. Control Fallacies – seeing ourselves as a victim (external control fallacy) or assuming the responsibility for the pain and happiness of everyone around us (internal control fallacy). Discounting the Positive – discounting your achievements or insisting your positive actions, achievements or qualities don’t count; saying anyone could’ve done it.. Fairness Fallacy – going through life applying a measuring rod against every situation judging its fairness; feeling resentful because we thing we know what is fair but others won’t agree with us. Always Being Right – feeling continually on trial to prove that your opinions and actions are correct (or pointing out how wrong someone’s opinions and actions are). Being wrong is unthinkable going to any length to demonstrate your “rightness”. Heaven’s Reward Fallacy – expecting your sacrifice and self-denial to pay off, then feeling bitter when the reward doesn’t come. What have you discovered? What distortions do you recognize in yourself? Where do you want to begin making changes? You’ll have an opportunity in the next post to find out more about what you can do about your “stinkin’ thinkin” and improve your rate of success – however YOU define success. In Part 1, we looked at 5 Cognitive Distortions: Filtering, Polarized Thinking, Over-generalization, Catastrophizing and Personalization. What have you discovered about you and your cognitive distortions? What, if any, resonate with you so far? Let’s take a look at 5 more Cognitive Distortions (in no particular order or sequence). 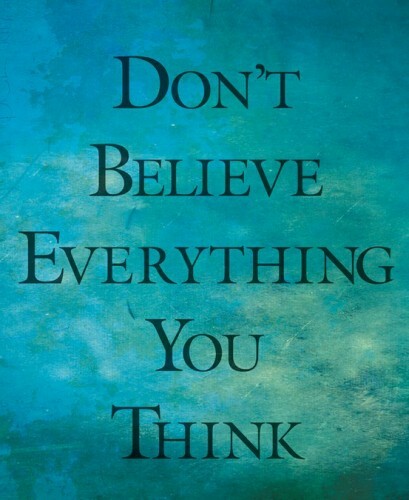 Remember, although your thinking can affect your emotions, behaviors, actions, habits and decisions, your thinking doesn’t have to define who you are. You can change the way you think and your thought awareness is the first step. 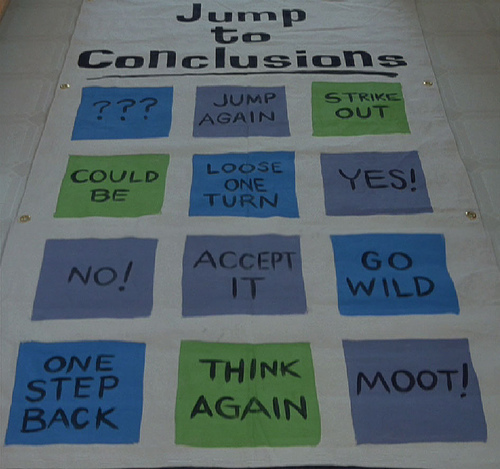 Jumping to Conclusions– making assumptions with little or no evidence to back it up. Fortune Telling – making negative predictions based on assumptions about what the future will hold. Mind Reading – making negative assumptions based about how people see you or feel about you, without factual information. Emotional Reasoning – “I feel, therefore, I am.” In other words, assuming that a feeling you have reflects the way things really are. Shoulds – having adamant rules and/or beliefs about your’s and other’s behaviors, which leads to criticism of yourself or others. That criticism can lead to feelings of guilt, resentment, anger and/or frustration. Listen to your words when you talk about yourself or others. Are you using words such as should, must, have to, ought to, need to? What’s jumping out at you? Where do you want to begin making changes? As a reminder, at the end of the series, you’ll have an opportunity to find out more about what you can do about your “stinkin’ thinkin” and improve your rate of success – however YOU define success. This question, “What were you thinking?”, was addressed recently in a 3-part newsletter series. The language you use every day (spoken and unspoken) both represents and impacts how you experience your world. In your attempt to capture thoughts, ideas and describe what you see around you using words, things can get “lost in the translation”. Information is lost through “deletion” of information, “generalization” and “Cognitive Distortion”. Distortion is where some aspects of ideas and experiences are given more weight and focus than others. Cognitive Distortions are simply ways your mind convinces you of something that isn’t true. These inaccurate thoughts are most often used to reinforce negative thinking or emotion, telling you things that may sound rational and accurate, when in fact, they are not. Everyone does this consciously and unconsciously. How you process information provides pointers to your underlying beliefs about yourself, others and the world. In Part 1, of our 3-part series, let’s take a look at 5 of 15 Cognitive Distortions. At the end of the series, you’ll have an opportunity to find out more about what you can do about your “stinkin’ thinkin” and improve your rate of success – however YOU define success. Filtering – taking the negative details and magnifying them while filtering out any or all positive aspects of a situation. For example: You have a great evening with friends dining at a restaurant, but your steak was overcooked and that ruined the whole evening. Over-generalization – coming to a general conclusion based on a single incident or single piece of evidence. If something bad happens once, you expect it to happen over and over again. For example: She always does that. P.S. — Want to learn more about Cognitive Distortions and how they may be impeding your progress and success? Schedule your private, confidential complimentary discovery session or send an e-mail to info@JoshuaTreeCoaching.com to learn how. Invest 30 minutes today to change your life forever. Being assertive starts with knowing what you are—and aren’t—willing to be, do, or have. For many of us, coming to this knowledge is a real task unto itself. Here, it may be useful to ask: “In an ideal world, what would I like to happen?” Focusing on an ideal, reasonable and realistic outcome opens our minds, prevents us from falling into passivity or “victim-thinking,” and helps us get really clear on what we want and don’t want. Once you know what outcome you desire, share it with that person in your life. Pay attention to the way stating your boundary feels in your body. With practice, you can actually sense when you’re hitting the “sweet spot.” It can feel really pleasant, even exhilarating, to express your needs or desires out loud. Phrases like “such and such doesn’t work for me” are simple ways of being assertive while maintaining connection with the other person. 3. Make a Regular Habit of Stating Your Needs and Desires. You can build your assertiveness the same way you build any muscle: exercise. Practice speaking up about your needs, big or small, on a daily basis. When you speak up about things that are less controversial—such as where to go to dinner, requesting help with a task or what TV program to watch—both you and the other person get used to your assertiveness. It becomes easier for you to practice and for another to hear. Also, when bigger issues come along, you will have a healthy process in place for dealing with differences in needs, and you’ll have greater confidence in the resilience of your relationship. 4. Give as Much as You Get. Assertiveness is a two-way street. If you want your boundaries to be respected, you must return the courtesy to others in your life. If your partner doesn’t want you to interrupt her while she’s talking on the phone (unless it’s an emergency), don’t. If your co-worker asks you to give him fifteen minutes before an unscheduled meeting before you talk and connect, respect that. When it comes to following through on another’s reasonable request, actions really do speak louder than words. If someone in your life isn’t respecting your boundaries even though you’ve set them clearly, it may be time for professional help for you and/or your relationship. P.S. — Want to learn to be more assertive in you job, business or in general? Schedule your complimentary coaching session or send an e-mail to info@JoshuaTreeCoaching.com to learn how. Invest 30 minutes today to change your life forever. Questions…Wrapping up International Coaching Week Celebration! Over the course of the week, you’ve read a little bit about what the coaching profession is, what it has to offer you and/or your organization, as well as the value that coaching brings to your development, whether professionally or personally. Hopefully, what you already know about coaching was reinforced or you became more aware of how you will benefit from engaging a coach. And some of you still have more questions and a few of you are ready to hire a coach! A Guide to Hiring a Professional Coach (click on title to download) will give you additional information and insight to get you started with the hiring process. Thank you for celebrating with us this week! The official celebration may be ending, yet it doesn’t have to end and the celebration can continue for you each time you come back and visit the Roots of Thought blog. Take a moment to share your thoughts and comments. P.S. — Still have questions? Schedule your complimentary coaching session or send an e-mail to info@JoshuaTreeCoaching.com to learn how. Invest 30 minutes today to change your life forever. P.S. — Want to achieve something extraordinary? Schedule your private, confidential complimentary discovery session or send an e-mail to info@JoshuaTreeCoaching.com to learn how. Invest 30 minutes today to change your life forever. Lakia Gordon on What is Coaching?